Blending the informed analysis of The Signal and the Noise with the instructive iconoclasm of Think Like a Freak, a fascinating, illuminating, and witty look at what the vast amounts of information now instantly available to us reveals about ourselves and our world--provided we ask the right questions. By the end of an average day in the early twenty-first century, human beings searching the internet will amass eight trillion gigabytes of data. This staggering amount of information--unprecedented in history--can tell us a great deal about who we are--the fears, desires, and behaviors that drive us, and the conscious and unconscious decisions we make. From the profound to the mundane, we can gain astonishing knowledge about the human psyche that less than twenty years ago, seemed unfathomable. Investigating these questions and a host of others, Seth Stephens-Davidowitz offers revelations that can help us understand ourselves and our lives better. Drawing on studies and experiments on how we really live and think, he demonstrates in fascinating and often funny ways the extent to which all the world is indeed a lab. 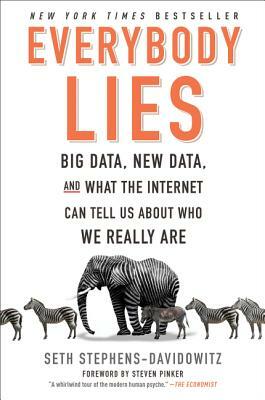 With conclusions ranging from strange-but-true to thought-provoking to disturbing, he explores the power of this digital truth serum and its deeper potential--revealing biases deeply embedded within us, information we can use to change our culture, and the questions we're afraid to ask that might be essential to our health--both emotional and physical. All of us are touched by big data everyday, and its influence is multiplying. Everybody Lies challenges us to think differently about how we see it and the world.